Awaken is the third album from Catch 22, although this is my first exposure to the band. Catch 22 is a four piece band from Marietta, Ohio playing intense and raw American power/traditional metal. Awaken features 13 raw, in your face tunes that clock in at over at hour of music. 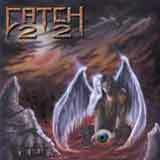 If you're into bands such as Jag Panzer, early Savatage, Sanctuary, and Nasty Savage to name a few, chances are that you'll appreciate Catch 22. These guys have come up with thirteen tracks that offer excellent musicianship, emotional delivery, and thoughtful lyrics. I am particularly impressed with the lyrics that deal with religious and governmental corruption. It's always a pleasure to listen to a CD with meaningful and interesting lyrics; Catch 22 deliver on that point. The lead vocals suit the music perfectly. T.J. Berry uses a powerful, aggressive delivery (ala Jon Oliva) throughout most of the album, but also adds in numerous Halford like shrieks. At any rate, the man delivers with steadfast conviction for the music he is involved with. Chugging riffs are the rule throughout the album, with some occasional Sabbath-y doom guitar licks sprinkled in. But, you will notice many moments throughout the album that are a nod to the Bay Area Thrash scene of the 80's. It would be unfair to leave out the fantastic rhythm section of Catch 22. Andy Brookhart is anything but predictable behind the kit and bassist Mike Allen provides solid (and sometimes very ominous) bass lines throughout. Into the Black is perhaps the highlight track of the album. Berry runs the gamut from shrieks to growls while the music features numerous time changes and altering moods that somehow have a natural flow start to finish. Again, thoughtful lyrics are the icing on the cake, making this track a killer without a doubt. If anything, I must say that Catch 22 are a model of consistency. The guys don't make the mistake of going for 3-4 killer tracks, while the rest of album floats in the land of mediocrity. Aside from the track Into the Black, which does stand out above the others to me, the rest of the album maintains a consistent level of quality that will leave you satisfied and banging your head with every track. The raw energy and aggression with which these guys perform is something that seperates themslves from the many sterile and souless albums that you'll find on the market today. Introspective lyrics will demand your attention and render this album very hard to use as just "background music." If hard edged, traditional heavy metal is something you appreciate, Catch 22 certainly have something to offer you. Solid musicianship, thoughtful lyrics, and an aggressive delivery sum up this band in a nutshell. Awaken is definitely one of the better indie releases I've heard in quite a while. The production is bit weak, but some may argue that it gives the sound a true "underground" feeling. Well, I can't argue with that assessment, but I sure would be curious to hear what these guys could do with a bigger budget.